was the spouse of the James Madison, fourth President of the United States under the Constitution of 1787. 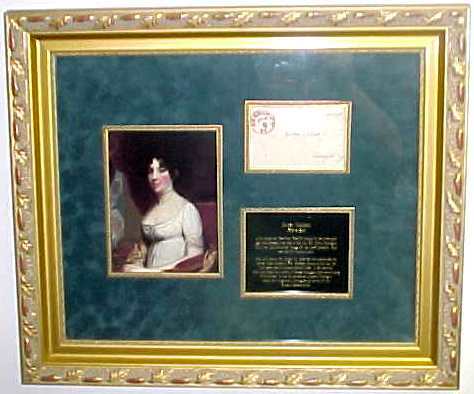 She was First Lady of the United States from 1809 to 1817 and renowned for her social gifts that contributed to the popularity of President Madison. 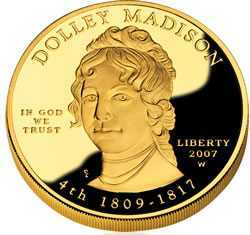 Dolley Madison ,was born Dolley Payne in Guilford County, N. C., on May 20, 1768. Her family moved to Virginia when she was an infant, and she spent the first 15 years of her life there. In 1783 her Quaker parents moved to Philadelphia, where, in 1790, she married Quaker lawyer John Todd, Jr. They had two children: one died in 1793 during the same yellow-fever epidemic that took her husband's life; the other was John Payne Todd..She married Congressman James Madison, 17 years her senior, on Sept. 15, 1794. The marriage, though childless, was apparently a very happy one. Mrs. Madison first served as "unofficial first lady" during the presidency of Thomas Jefferson, a widower, while her husband served as secretary of state. During her husband's presidency (1809-1817), she became the unquestioned center of Washington society. Noted for her graciousness and charm as well as her ability to entertain guests and preside at dinners, she was best known for her Wednesday evening receptions where politicians, diplomats and the general public gathered. At a time of intense party rivalries, these gatherings helped to soothe some of the tensions between Federalists and Republicans. 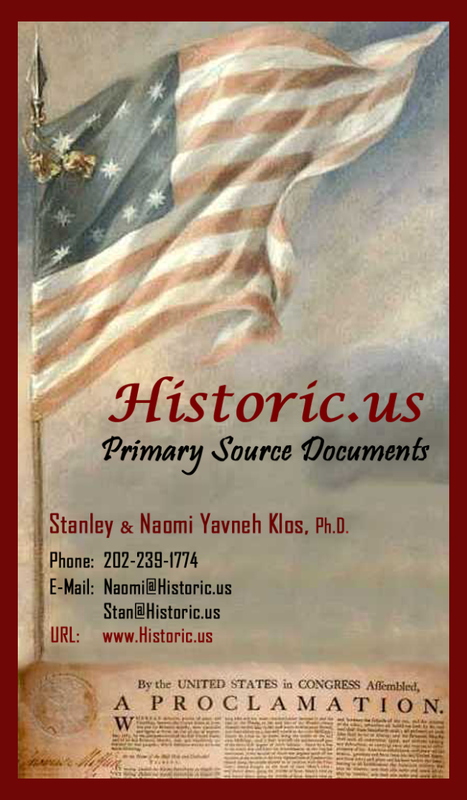 Correspondence indicates that not only was she an effective counter balance to her husband's rather colorless public personality, but that her influence on Madison's political decisions was not in the least insignificant. Notably, during the British invasion of Washington in 1814, she escaped to Virginia carrying important state papers, a Gilbert Stuart portrait of George Washington, and other personal valuables. Retiring to Virginia in 1817, the Madisons continued to entertain lavishly. After her husband's death in 1836, Mrs. Madison returned to Washington where her home once again became a center of social life. Her last public appearance was at a ball given for President Polk in 1848. She died in Washington on July 12, 1849. DOLLY PAYNE was a Virginian, though she was born while her parents were on a visit in North Carolina. She lived on a great plantation where she had wide fields to play in, and a devoted black mammy to look after her. Both her mother and grandmother were noted belles and Dolly, who was named for her second cousin, Mrs. Patrick Henry, evidently inherited their beauty, for as a very little girl, going to school, she wore a wide-brimmed sunbonnet and long mitts, to shield her face and arms from the sun. Dolly remembered how her father, in spite of the fact that they were Quakers, had buckled on his sword and ridden away to be a captain in the Revolutionary army, and how when the war was over, he came home again to join in the neighborhood's thanksgiving for America. Soon after the war, when Dolly was fourteen years old, he freed his slaves, sold the plantation, and moved north to the city of brotherly love that he might be among Quakers. It was then the largest town in the nation, with a reputation for being very rich and gay. But the Paynes maintained a strict Quaker standard of simplicity. Dorothy was a pretty girl, demure in her gray dress, but with bright Irish-blue eyes, long lashes, curling black hair and soft warm-hued skin. She had a particularly gay and joyous disposition, but was forbidden such pleasures as dancing and music. She went to the Friends' meeting-house where the men and boys in their black coats and broad-brimmed hats sat on one side of the room, the women and girls in their mouse-colored bonnets and drab gowns on the other. Dolly's father had done very well on the southern plantation, but when he went into business in Philadelphia he found many troubles. Living cost much more than in Virginia, a good deal of his property had been lost through the war and he failed, then ill health added its burden. A rich young Quaker lawyer named John Todd helped and advised him. He had fallen in love with Dolly, and though she meant never to marry, she consented, to please her father who had only a few months more to live. On two successive Sundays she went through the embarrassing Quaker ceremony of rising in meeting and saying she proposed taking John Todd in marriage; and standing up before the congregation, they were married in the somber bare-walled meeting-house. Mistress Todd lived for three years the life of a Quaker lady, and a devoted wife she was to her young husband. She always wore a cap of tulle, a gray gown, with a lace kerchief over her shoulders and a large brooch fastening it—no other ornaments. Except for her beauty she was like a hundred other young Quaker women in the city of brotherly love. In August of 1793 an epidemic of yellow fever broke out in Philadelphia. Todd sent his wife and their two little children to a summer resort on the river, where many of their friends took refuge He stayed in the city to care for his father and mother but they died of the plague. Already ill himself he joined his family, only to give them the dread disease, he and the baby dying shortly after his arrival. Dolly too was stricken with the fever, but recovered. At first she was bowed down by her great loss. But Philadelphia was gay and gradually Mistress Todd began going about again, far more freely than in the days of her sober girlhood. She found herself really enjoying society and all the pleasures of the city. From a shy girl she developed into a most attractive woman. With her youth and her riches, it is no wonder that she became the object of much attention. Gentlemen would station themselves to see her pass, and her friends would say, "Really, Dolly, thou must hide thy face. There are so many staring at thee!" Among her many admirers was Aaron Burr, then a United States senator. For Philadelphia, you remember, was the capital of the newly organized government, and the leading men of the time lived in the city. One day he asked her if he might bring a friend to call, for the "great little Madison," as his colleagues called him, had requested the honor of being presented. So the handsome Colonel Burr introduced Mr. James Madison, a little man dressed all in black, except for his ruffled shirt and silver buckles. Dolly wore a mulberry satin gown with silk tulle about her neck and a dainty lace cap on her head, her curly hair showing underneath. The scholarly Madison, who was twenty years older than she, was captivated by the pretty widow, sparkling with fun and wit, and soon offered himself as a husband, and was accepted. The President and Mrs. Washington were much pleased when they heard of the engagement. Sending for Dolly Mrs. Washington asked her if the news was true. "No, I think not," said Mistress Todd. "Be not ashamed to confess it, if it is so. He will make thee a good husband and all the better for being so much older. We both approve of it. The esteem and friendship existing between Mr. Madison and my husband is very great, and we would wish you two to be happy." Happy they were, during the week's journey when they drove down to Virginia, to be married at the home of Dolly's sister; and during the merrymaking following the wedding which lavish southern hospitality, with a ball and feast after the ceremony, made quite different from her first marriage. The quiet reserved Madison let the girls cut off bits of his Mechlin lace ruffles as keepsakes. And happy they were together for more than forty years. They lived only a short time at Montpelier, Madison's home in the Blue Ridge country, for public affairs soon took them back to Philadelphia and then to Washington. At her husband's request Dolly laid aside her Quaker dress, entered society and entertained frequently. Her sweet manners, her tact and kindness of heart, made her friends everywhere. At that time party spirit ran high and political differences caused great bitterness, but all animosities seemed forgotten in Mrs. Madison's presence. She slighted no one, hurt no one's feelings, and often made foes into friends. Perhaps her influence had almost as much to do with Madison's prominence in national affairs as did his own unquestioned ability; for her sound common sense and exceptionally good judgment often helped him in deciding public questions. When Jefferson was elected president he made Madison his secretary of state. And since Jefferson was a widower and needed a lady to preside at the White House, he often called upon Mrs. Madison for this service. Then Madison succeeded Jefferson and Dolly became in name what she had been in effect, the first lady of the land. Thus for sixteen years she was hostess for the nation, and a famous hostess she was indeed. "Every one loves Mrs. Madison," said Henry Clay, voicing the common sentiment. "And Mrs. Madison loves everybody," was her quick response. The president used to say that when he was tired out from matters of state a visit to her sitting-room, where he was sure of a bright story and a hearty laugh, was as refreshing as a long walk in the open air. But even with such a mistress of the White House the affairs of the nation did not remain tranquil. Trouble with England, which had long been brewing, came to a crisis and war was declared in 1812. As most of the fighting was at sea, life at Washington went on undisturbed until August of 1814, when the British landed five thousand men near the capital and marched to attack it. The town was" in a panic when the messenger rode in at full speed, announcing fifty ships anchoring in the Potomac. "Have you the courage to stay here till I come back, to-morrow or next day?" asked the president. And Dolly Madison replied, "I am not afraid of anything, if only you are not harmed and our army triumphs." "Good-by then, and if anything happens, look out for the state papers," said Madison, and rode away to the point where the citizen-soldiers were gathering. "Enemy stronger than we heard at first. They may reach the city and destroy it. Be ready to leave at a moment's warning." Most of Mrs. Madison's friends were already gone, even the soldiers who had been left to guard the executive mansion. Not a wagon could be secured. "Bring me as many trunks as my carriage will hold," ordered Dolly Madison and set to work packing them with the-nation's most valuable papers. Night came but the lady of the White House worked on. At dawn she began searching through her spyglass, hoping to catch a glimpse of her husband. All she could see was here and there a group of soldiers wandering about, men sleeping in the fields, frightened women and children hurrying to the bridge over the Potomac. She could hear the roar of cannon, the battle was going on only six miles away; still the president did not come. One of the servants, French John, offered to spike the cannon at the gate and lay a train of powder that would blow up the British if they entered the house. But to this Mrs. Madison objected, though she could not make John understand why in war every advantage might not be taken. About three o'clock in the afternoon two men covered with dust galloped up and cried, "Fly, fly! The house will be burned over your head!" Some good friends had succeeded in getting a wagon and Mrs. Madison filled it with the White House silver. "To the bank of Maryland," she ordered, and added to herself, "or the hands of the British— which will it be?" Two friends came in to urge haste, reminding her that the English admiral, Cockburn, had taken an oath that he would sit in her drawing-room and that other officers had boasted they would take the president and his wife both prisoner and carry them to London to make a show of them. They were just ready to lift her into the carriage when Dolly stopped. "Not yet—the portrait of Washington—it shall never fall into the hands of the enemy. That must be taken away before I leave the house." The famous painting by Gilbert Stuart was in a heavy frame, screwed to the wall in the state dining-room, but in that frantic hurry there were no tools at hand to remove it. "Get an axe and break the frame," commanded Dolly Madison. She watched the canvas taken from the stretcher, saw it rolled up carefully, and sent to a place of safety. Later it was returned to her, and to-day hangs over the mantel in the red room of the White House. One more delay—the Declaration of Independence was kept in a glass case, separate from the other state papers. Notwithstanding all the protests of her friends, Dolly Madison ran back into the house, broke the glass, secured the Declaration with the autographs of the signers, got into her carriage and drove rapidly away to « house beyond Georgetown. None too soon did she leave. The sound of approaching troops was heard. The British were upon the city. They broke into the executive mansion, ransacked it, had dinner there in the state dining-room, stole what they could carry, and then set fire to the building. Instead of sleeping that night, Dolly Madison, with thousands of others, watched the fire destroying the capital, while the wind from an approaching storm fanned the flames. Before daybreak she set out for a little tavern, sixteen miles away, where her husband had arranged to meet her. The roads were filled with frightened people, while fleeing soldiers spread the wildest rumors of the enemy's advance. A full address leaf, Free Frank "Free D.P. Madison" by her at the upper right, and addressed in her hand to Miss Mary E.E. Cutts in Washington. With a very dark circular red "Orange C.H. 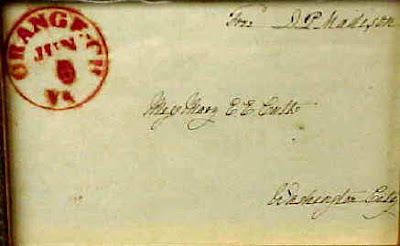 VA June 8" postmark Black seal with "DM" initials is intact. Arrived at the inn finally in the height of the storm, the woman in charge refused to take her in, saying, "My man had to go to fight; your husband brought on this war and his wife shall have no shelter in my house!" The tavern was thronged with women and children, refugees from the city, who finally prevailed on the woman to let Mrs. Madison enter. The president arrived later, but before he had rested an hour a messenger came crying, "The British know you are here—fly!" Dolly Madison begged him to go to a little hut in the woods where he would be safe, and promised that she.would leave in disguise and find a refuge farther away. In the gray of the morning she started, but soon came the good news that the English, hearing reinforcements were coming, had gone back to their ships. At once she turned and drove toward the city. The bridge over the Potomac was afire. "Will you row me across?" she asked an American officer. "No, we don't let strange women into the city." In vain she pleaded. He was firm. "We have spies enough here. How do I know but the British have sent you to burn what they have left? You will not cross the river, that is sure." "But I am Mrs. Madison, the wife of your president," she answered, throwing off her disguise. Then he rowed her across the Potomac. Through clouds of smoke, past heaps of still smoldering ruins, she made her way to the home of her sister, and waited there for Mr. Madison to return. While the White House was being rebuilt the Madisons lived in Pennsylvania Avenue, and a brilliant social life centered about them. They revived the levees of Washington and Adams, gave handsome state dinners and introduced music at their receptions. When Madison's second term was ended they went to live at Montpelier, their beautiful Virginia home, where they entertained with true southern hospitality the many friends and tourists who visited them. Mr. Madison, for many years an invalid, busied himself with books and writing. This is a letter by First Lady Dolley Madison to her sister, Anna, written the day before Washington, D.C. was burned by British forces during the War of 1812. 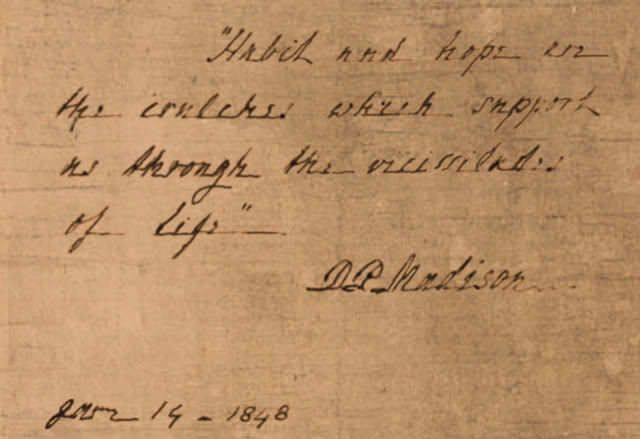 The letter describes the desertion of the White House and Mrs. Madison's famous actions savingGilbert Stuart's portrait of George Washington. As Mrs. Madison fled she met her husband the President, and together, from a hillside, they watched Washington burn. My husband left me yesterday morng. to join Gen. Winder. He enquired anxiously whether I had courage, or firmness to remain in the President's house until his return, on the morrow, or succeeding day, and on my assurance that I had no fear but for him and the success of our army, he left me, beseeching me to take care of myself, and of the cabinet papers, public and private. I have since recd. two despatches from him, written with a pencil; the last is alarming, because he desires I should be ready at a moment's warning to enter my carriage and leave the city; that the enemy seemed stronger than had been reported, and that it might happen that they would reach the city, with intention to destroy it. . . . . I am accordingly ready; I have pressed as many cabinet papers into trunks as to fill one carriage; our private property must be sacrificed, as it is impossible to procure wagons for its transportation. I am determined not to go myself until I see Mr Madison safe, and he can accompany me, as I hear of much hostility towards him, . . . . disaffection stalks around us. . . . My friends and acquaintances are all gone; Even Col. C with his hundred men, who were stationed as a guard in the enclosure . . . . French John (a faithful domestic,) with his usual activity and resolution, offers to spike the cannon at the gate, and to lay a train of powder which would blow up the British, should they enter the house. To the last proposition I positively object, without being able, however, to make him understand why all advantages in war may not be taken. Wednesday morng., twelve o'clock. Since sunrise I have been turning my spyglass in every direction and watching with unwearied anxiety, hoping to discern the approach of my dear husband and his friends, but, alas, I can descry only groups of military wandering in all directions, as if there was a lack of arms, or of spirit to fight for their own firesides! Three O'clock. Will you believe it, my Sister? We have had a battle or skirmish near Bladensburg, and I am still here within sound of the cannon! Mr. Madison comes not; may God protect him! Two messengers covered with dust, come to bid me fly; but I wait for him. . . . At this late hour a wagon has been procured, I have had it filled with the plate and most valuable portable articles belonging to the house; whether it will reach its destination; the Bank of Maryland, or fall into the hands of British soldiery, events must determine. Our kind friend, Mr. Carroll, has come to hasten my departure, and is in a very bad humor with me because I insist on waiting until the large picture of Gen. Washington is secured, and it requires to be unscrewed from the wall. This process was found too tedious for these perilous moments; I have ordered the frame to be broken, and the canvass taken out it is done, and the precious portrait placed in the hands of two gentlemen of New York, for safe keeping. And now, dear sister, I must leave this house, or the retreating army will make me a prisoner in it, by filling up the road I am directed to take. When I shall again write you, or where I shall be tomorrow, I cannot tell! !